Thanks, been waiting for something like this. Seriously though, great work DillDoe! Im having difficulty to understanding this tool. So the purpose of this is an alternative backup method for case like you accidentally delete/remove a character cards in chara folder?. Last edited by shiromarui; 10-29-2016, 04:04 AM. Im having difficulty to understanding this tool. So the purpose of this is a alternative backup method for case like you accidentally delete/remove a character cards in chara folder?. To put it simply, the purpose of this tool is to extract characters frome studio scenes. You find a character you want in a scene, you use this tool, and bam you will have the character card for this character. Its a very, very good tool, thanks DillDoe ! Last edited by hgrtdvehdbwvd; 10-29-2016, 02:48 PM. what did you use to bypass the Ip block ? Bogole77 But don't you have that character in normal game? so what's the point of making a card of a character when you already have it? They said it couldn't be done! But I always knew... You never underestimate the power of perverts!!!! "WOOOOOOOOOOOOOOOOOOOOOOOOOOOOOOOOOOOOOOOOOOOOOOOO OOOOOOOOOOOOOOOOOOOOOOOOOAAAAAAAAAAAAAAAAAAAH, AAAH, POURRA! HU-HU"
Cleep Ah i see..... i forgot that there is HS scene sharing site in the illusion.jp. But geeeezez holy brownies!, look how many of scenes from there contained hard-boiled effortness of DIY styled map !!!!!!!!!!!!!!!! Last edited by shiromarui; 10-30-2016, 03:34 AM. HAHAAHHA! 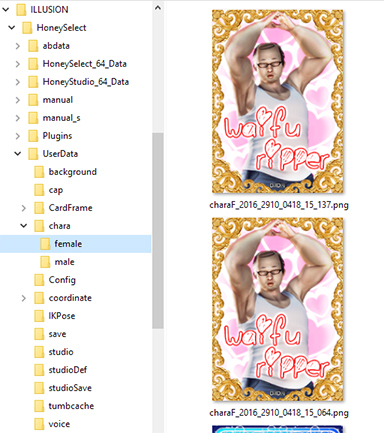 "SUPER GOLD FOIL WAIFU RIPPER CARD"
Really usefull tool, thanks buddy ! Hey Dildoe you think you can make a randomizer or parent/child mix like AA2? You know the software that averages or combines the stats of 2 girls or a couple and spits out children? that's currently way beyond my programing skills and honestly between modding & maintaining slot manager, I just don't have the time to start another programming project. This does not work on SBPR? So open up your Studio Scene (or character card) and click 'Snowflake'. You can now choose a png image to replace your current load one. It'll make a copy and display the new image. I am unsure what does it means? Are you saying that the screen shots taken by pressing **F11** character can be replaced or extracted with **Snowflake**? Each png consists of an image - which can be displayed with every image viewer - and game related data, e.g. the height of the character, which clothes are used, etc. The Snowflake function seems to replace the image part in the file. So the game and image viewers would show the replaced image, but the game would still load the same scene or character. no. Snowflake is replacing your saved studio or character image with another image (ie. screenshots). So instead of a tiny studio save image, you can have a high res screenshot instead and still share it. Will there an update to be able to rip from high res png files that are over 1mb? you mean like from screenshots? No, it's impossible. those are just images, there are no saved game info to rip. Unless they are Snowflaked images (studio scenes replaced with high res png), the program will let you know if you can rip an image or not once you open it by checking to see if there is game info in it.